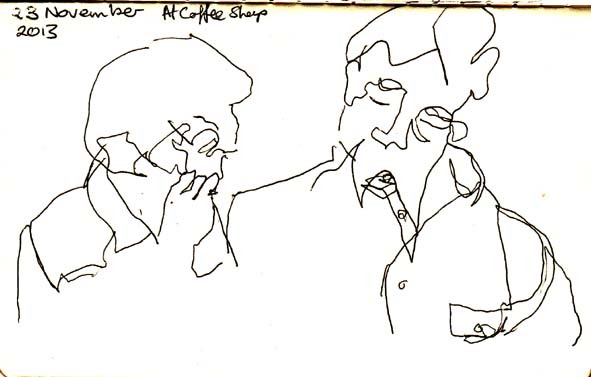 At the coffee shop a drawing of a couple chatting and drinking. Chatting at the coffee shop, 23 November 2013. The other day I had to drive up to Goulburn to collect my work that was in the Goulburn Art Award. Half way between Goulburn and Canberra lies Lake George. While the lake’s comings and goings have been of interest for many years, the current ‘big issue’ are the numerous wind turbines that have been installed on the south-eastern side of the lake. I thought it was about time that I stopped at one of the rest areas on the lake shore and did some drawings of the turbines. Horizon line and wind turbines, Lake George, 18 November 2013. My first sketch showed me that this was perhaps more challenging than I had imagined. The two lines of wind turbines, drawn above, represented all the turbines I could see. I broke the line in two to fit them all on the page. Scale is clearly an issue. I really need to get closer to the turbines to be able to draw them as more than stars on sticks. And the wretched things kept moving all the time! Anyway a bit of research on the web has revealed that this wind farm holds open days so I’ve signed up to join a tour at some unspecified time in the future. 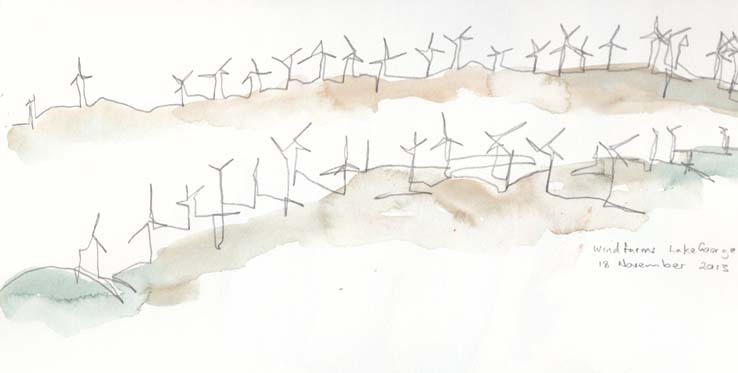 Further wind turbine drawings will wait. We’d packed a picnic lunch for our little excursion so while I was eating I turned my back on the turbines and looked at what was in front of me. Here I was on more familiar territory, a carpark! 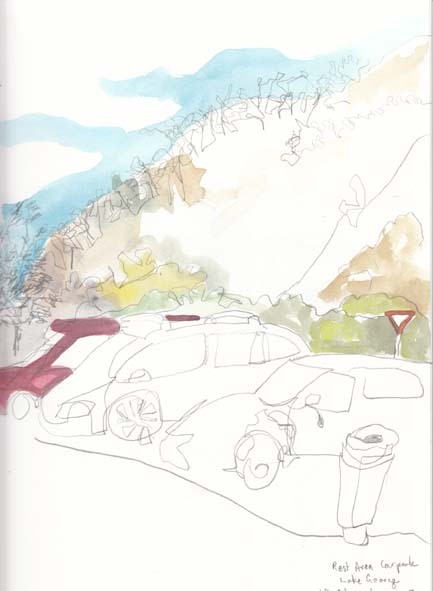 Escarpment and carpark, Lake George, 18 November 2013. And better still, an overflowing rubbish bin. Garbage bin, Lake George, 18 November 2013. 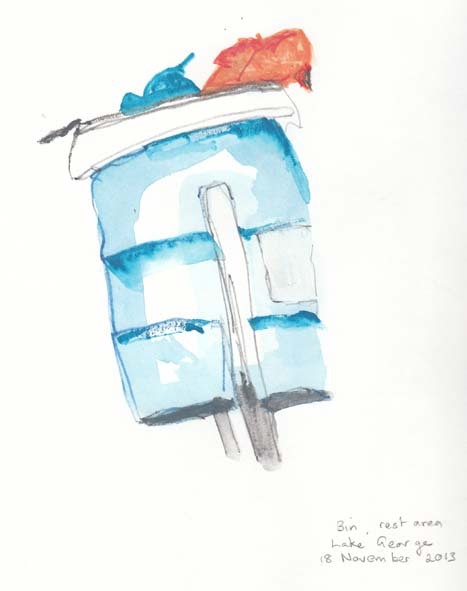 Such are the inspirations of the everyday artist. The latest show at the Drill Hall Gallery is Ben Quilty’s ‘Trigger Happy’. While I have seen quite a bit of Quilty’s work on the TV, following his stint as an Official War Artist in Afghanistan, this is the first time I’ve seen a whole show of his work in the flesh. The ‘Baby’ room. A number of paintings of Quilty’s children and also a painting by young Joe Quilty at the Drill Hall Gallery. And ‘fleshy’ is definitely a good way to describe Quilty’s painting style. The oil paint is applied in such generous amounts that I had to wonder how any work painted this year managed to dry in time for the show. Not to worry they did and they are on the walls. The show includes a large number of portraits, a series of landscapes and a room of delicate works in watercolour pencil along with some prints. While I was there the room of family portraits was attracting the greatest number of visitors. The end wall is dominated by two large portraits of the artist’s son. On another side is a ‘Rorschach’ painting of his daughter (on the left hand side of the photo above) and other members of the artist’s family. While the two portraits of Joe dominate there are equally equally eloquent smaller images such as the head and shoulders portrait of Kylie and another portrait of Joe in watercolour (on the far right of the photo above. Clearly people were responding to these beautiful works – there was no 10 seconds and then move on in front of these paintings. The other room which really impressed me was the one containing the drawings. These small works demonstrated such a delicate touch and clearly showed Quilty’s fine drafting skills . I made sure I had plenty of time to see the show so I was able to do some blind drawings of some of the works I enjoyed. 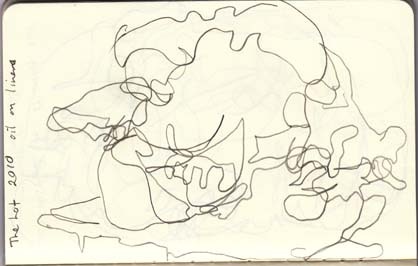 The outcomes of doing a blind drawing of a large gestural painting can be rather obscure, so once I got home I scanned my drawings and then did some additional work on them in Photoshop©. For the two drawings you can see the original and then the version I coloured, drawing on similar colours to those used in Quilty’s paintings. I was pleasantly surprised with the result for both images. 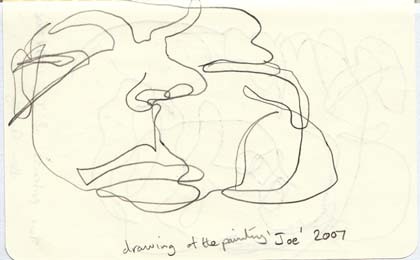 Blind drawing of ‘Joe’ by Ben Quilty, 2007. 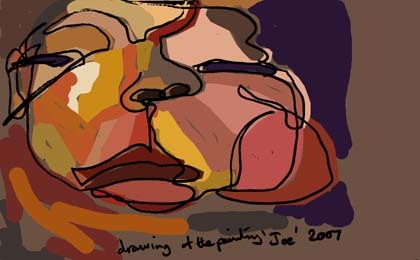 Blind drawing with colour of ‘Joe’, by Ben Quilty 2007. 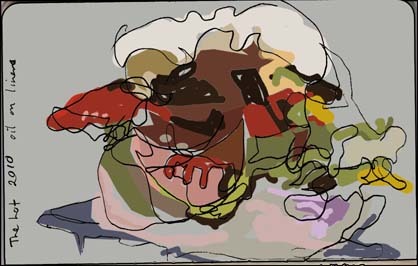 Blind drawing with colour of ‘The Lot’, by Ben Quilty, 2010. We were having a lovely time sitting in bed and reading this morning when our cat decided to join us. Not wanting to disturb her I grabbed what was to hand, some pull out pages from my partner’s magazine, and my nearest pen. 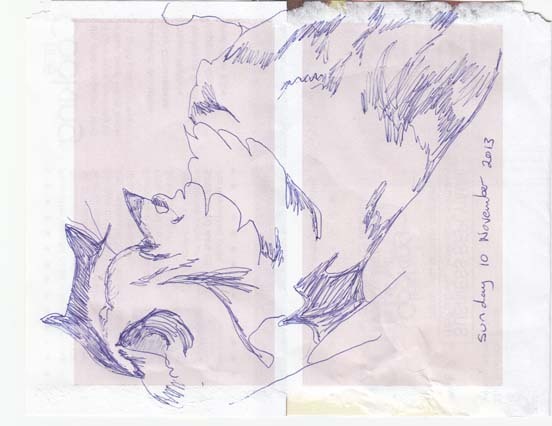 I made three sketches of the cat. My cat and her shadow, 10 November 2013. Cat asleep on the bed, 10 November 2013. Cat on the bed, 10 November 2013. Sometimes on Saturday morning we stop in at a nearby Italian bakery for a cannoli and a cup of coffee. Here’s today’s cannoli and our forks. Cannoli and forks, 9 November 2013. Later I decided to add some colour. 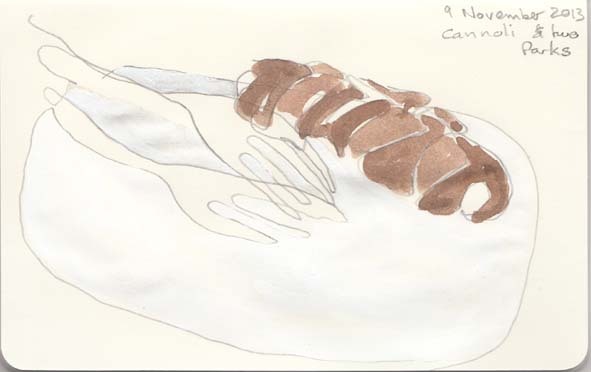 Cannoli with added colour, 10 November 2013. Back to the bike racks. I think today’s effort is much improved over the one I drew last week. Bike racks at the cafe, 6 November 2013. And with the magic of my concertina book I can show them to you side by side. 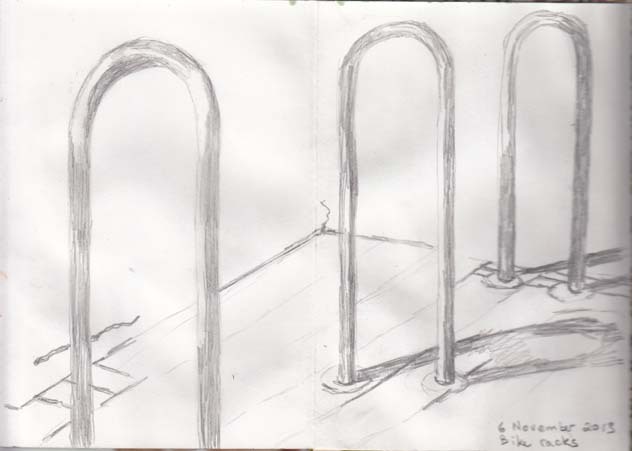 Side by side, my bike rack drawings of 30 October and 6 November 2013. 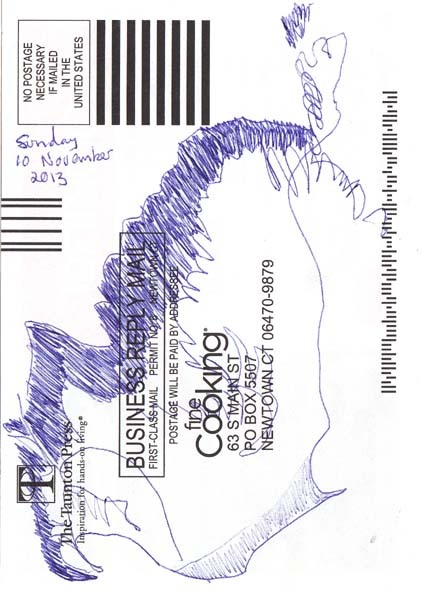 I just received my return postcard from the Big Draw, held at the National Gallery of Australia on 27 October this year. 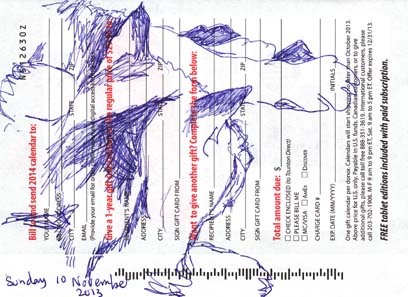 My return Big Draw postcard from last month’s event at the National Gallery of Australia. Earlier in the day I read that The Big Draw came about when the Guild of St George, a charitable organisation founded by John Ruskin, decided to celebrate the centennial of Ruskin’s death. 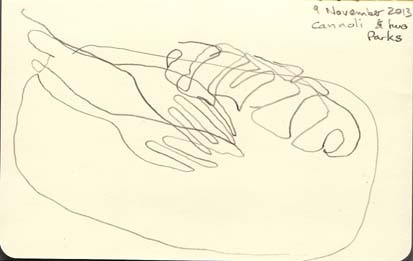 The aim of the celebration was “to get everybody drawing” (Christian McEwen’s book World Enough and Time) . 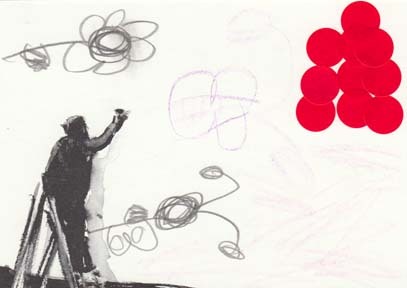 The Big Draw continues to be celebrated annually in the UK and around the world under the auspices of The Campaign for Drawing, which is funded, in part, by the Guild. Serendipity!